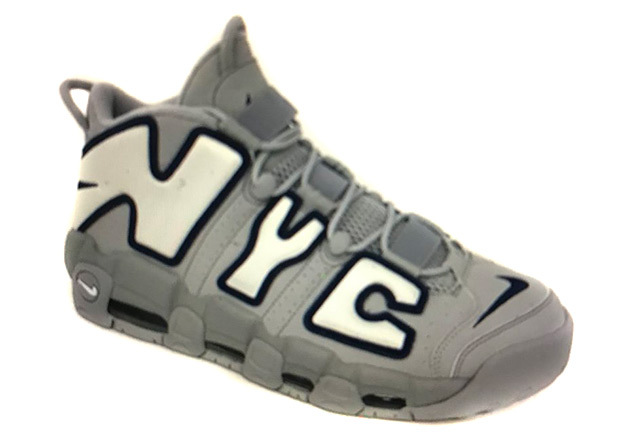 The third and final Nike Air More Uptempo colorway of the “City Pack” is revealed as New York City will be treated with this grey and navy colorway on December 20th. Releasing alongside the Chicago and Atlanta pairs, this NYC-themed variety is sure to feature some design elements specific to the region, similar to how a giant peach logo was embroidered on the heels of the ATL version. Of course the primary feature of this drop is the oversized NYC in white with navy borders replacing the customary AIR on the upper. Get these at select retailers later this month and stay tuned for updated photos.